Ayurvedic Herbal Hills ARTHROHILLS Joint Pain Relief soft capsules (30)Arthrohill..
Ayurvedic Herbal Hills ARTHROHILLS Joint Pain Relief soft capsules - Value Pack (900) ..
Vee Excel Herbal HEALTH KIT - Heart, Hypertension & Joints Brave Heart is pur..
Also known asRheumo tabPropertiesWeight91 (gms)Dimensions4..
HAWAIIAN HERBAL ARTHRITIS DROPS IS A DIETARY HERBAL SUPPLEMENT LAUNCHED IN INDIA BY MAA ADISHAKTI MU.. This supplement has been formulated to provide maximum nutritional support for joints. * A prima..
Aam-Vatantak Churna helps to maintain the good joint health.It helps to balance the kapha, pi..
Ayurvedic Herbal Hills Boswahills (SHALLAKIHILLS) Joint Care capsules (60)Sanskri..
Sahyog Herbals WHEATGRASS Juice with Tulsi & Giloy (500 ml)Increases red blood-cell cou..
Nuroshrey-OD is an advanced neurological pain relieving formula. It promotes and encourage..
Alacoma is a specially designed nutraceutical formula to support ageing eyes & its functionality..
Chandraprabha Vati (100 tablets) Chandraprabhavati is a classical formulation that improves urinary ..
Do you suffer from Arthritis, back pain, Rheumatic disorders, Neck pain or Osteoporosis? 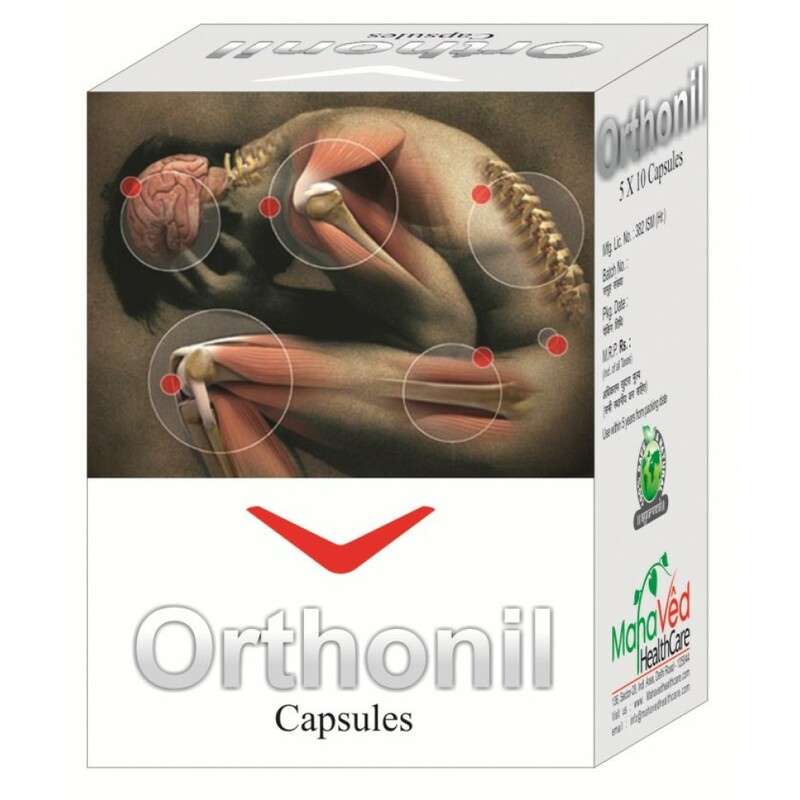 If yes, then this Mahaved HealthCare Orthonil Cap will be perfect for you. This medicine is known to reduce sciatica pain, joint pains, stiffness of the back and the shoulder. It also helps in increasing the blood flow to the joints. Made from the magical natural extracts of Kesar, Lohban, Rasna, Ashwagandha and Nirgundi Nag Bhasma Amla, this ayurvedic medicine would be an ideal option when it comes to everyday use. This amazing capsules are sure to alleviate you of all joint aches, without side effects. Kesar (Crocus Sativus/Saffron) 150mcg. Sonth (Zingiber Officinale) 15mg. Lohban (Benzoinum) 12mg. Punarnava (Boerhaavia Diffusa) 25mg. Rasna (Vanda Roxburghii) 30mg. Suranjan (Colchicum Inteum Baker) 30mg. Abhrak Bhasma (Mica) 15.85mg. Bang Bhasma (Stanium Oxide/Stallum) 7mg. Ashwagandha (Withania Somnifera) 25mg. Giloy (Tinospora Cordifolia) 16mg. Nirgundi (Vitax Negundo) 18mg. Harar (Terminalia Chebula) 18mg. Kantkari (Solanum Xanthocarpum) 5mg. Pipalamool (Piper Longum) 15mg. Nisot (Operculina Terpethum) 25mg. Chobchini (Smilax China/S. Clabra) 12mg. Nag Bhasma (Plumbum) 65mg. Nagarmotha (Cyperus Rotundus) 25mg. Amla (Emblica Officinale) 16mg. Base Q.S. Ayurveda medicines are scientifically proven to cure the ailments, without having any side effects. The natural ingredients like herbs, leaves, seeds, roots and other plant extracts are used to prepare these medicines. These natural products cause no harm to the health and provide complete cure to the ailments. 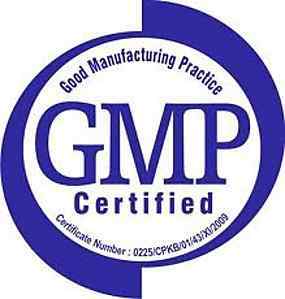 Our products are manufactured using hands-free and fully automated manufacturing plants are nationally and internationally certified. Excellent . Got delayed due to courier. This is great quality. I was suspicious due to the low price but this is genuine. Delivered on time as always..
Hawaiian anti arthritis capsule range that offers an ideal remedy for rheumatism and pain, low back .. INDICATIONS: For treatment of osteoarthritis; ostitis; osteoporosis; disturbed bone formation, and p..
Rheumata capsules is a dietary supplement introduced by siddhidatri multi trade enterprisers, an iso..